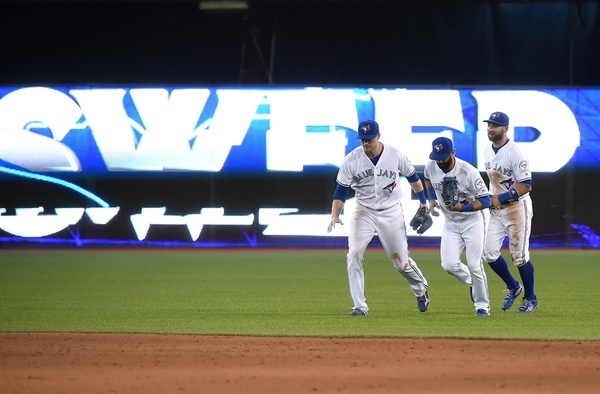 Hard to find anything to piss and moan about that one, as the Blue Jays eventually took it to the New York Yankees, posting a 7-0 scoreline that belies the tense affair of the first six innings or more. It was just 2-0 for the Jays in the top of the seventh when Jason Grilli made his Jays debut with two on and two out. He immediately threw a pick-off attempt at second base into centre field — bringing my “this will end in tears” prediction, which you can hear on this week’s Birds All Day podcast, dangerously close to fruition — but, in the most veteran-ly way possible, got Carlos Beltran to fly out to Kevin Pillar to end the threat. And with New York’s non-good relievers coming into the game after that point, that was as close to avoiding the sweep that the Yankees would get. It’s not too big an issue yet, though. Sanchez pitched an additional 9.2 innings in rehab starts last year, and he’s still 51 innings short of his career high for a season (133.1), set in 2014. – It still kinda feels like 2015. And with Boston possibly about to wind up on the losing end of one in Baltimore (though nobody should say for sure until the final out — it’s been wild), the Jays might wake up tomorrow just four games out with a three game series against the division leaders upcoming. Nobody’s run away with this division just yet. (Nor will they have if the Jays hit a speed bump at Fenway, either). – The Jays crossed the 1,000,000 fan mark tonight, in what was their 28th of 81 home games. For context: they only drew 1,495,482 to Rogers Centre over the entirety of 2010. – Lastly, picture of the folks in the press box as the legendary Bob Elliott serves his final night on the beat. I wrote some words about Bob in last night’s recap. Won’t be the same without him. I re-watched our pitching from last night’s game and I can’t help wanting to comment on Sanchez because … holy moly, can Sanchez PITCH!! A terrific fastball with velocity that never travels in a straight line combined with an ungodly curve ball that leaves big league hitters stupefied … he’s a very rare commodity. Fingers crossed but man, it could be fun watching Aaron Sanchez pitch his way into whatever’s coming in the future. He’s fantastic and I’m not even sure we’re all making a big enough deal about how good he is. Cuz he’s so, so good. I’ve been a big believer in Sanchez’ talent since he was in A-ball, and I agree that he’s a rare commodity – possibly he might even be better than Thor. While Russell has absolutely done the right thing in temporarily removing the cutter from Aaron’s repertoire (it is a noticeably inferior pitch to even his changeup), long-term, developing that pitch could be the difference-maker for Sanchez. It improves a righty’s odds against power-hitting lefties, but it’s a harder pitch to master than the sinker. Even Roy Halladay didn’t master it until 5+ years into his MLB career when Sal Fasano showed him a grip that worked. Has any other player committed an error the first time he touched the ball in a Blue Jays uniform.